Emma Conway shares one of the most difficult yet rewarding experiences a student can have. Emma Conway and Cathy Belhumer sitting on a deck at a cabin in Hayward, Wisconsin. Two days after Thanksgiving, I walked up to the podium feeling sick to my stomach. Peering out into the large room where the funeral service was being held, there were almost two hundred people of all ages and ethnicities there for my Aunty Cathy. 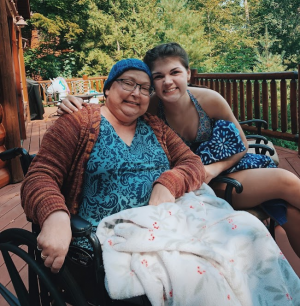 I knew I wanted to share the amazing life that she lived and how hard she fought her battle with stage four brain cancer, but at that very moment I wanted to run away. “I wrote this for my Aunty Cathy. I’m going to try my best to get through this for you guys, okay?,” I said into the microphone. Tears began to stream down my face after this statement, making my voice tremble and my sobbing obvious to everyone in the room. One of my hands tightly held onto the podium, the other wrapped around my stomach as I was trying to give the speech I worked so hard on. Somehow, in someway, I began to speak through the tears. Looking back on that day two months ago I realize that giving a speech at my Aunty Cathy’s funeral was the ugliest, most beautiful thing I have ever done. By looking at the ugly and then comparing it to the beautiful, I would highly recommend speaking at a loved one’s funeral. Being that vulnerable and emotional in front of that many people was extremely difficult. What’s funny was before the speech I felt numb, trying to forget what I was about to do while also trying to stay strong to pay tribute to my Aunty Cathy. Senior, Molly Bowen, shared a similar experience when she gave a speech at her grandpa’s funeral when she was in fifth grade. “Before I gave the speech I felt very confident and only a little bit nervous. While I was giving the speech, I started crying after a couple of words and I kind of wanted to sit back down if I’m being honest,” Bowen shared. The getting started and trying to control the crying just enough to say what needed to be said was the hard part-the ugly. That part wasn’t pretty, but at the same time it was beautiful. When I finished my speech, I headed back to my seat. My Uncle Tony stopped me, gave me a hug and said, “Your Aunty Cathy would be so proud of you.” Once the service was over, everyone headed to the room next door for refreshments. Walking through the crowd, people I had never met before gave me compliments on how “well written my speech was” or “how beautifully I spoke” or how much “my words truly meant to them”. The gesture was sweet, but not because I was receiving compliments. Rather, the compliments made me realize how many people my Aunty Cathy touched on earth. How she shared her huge heart, sarcastic comments, and incredible work ethic with everyone she came in contact with was truly astonishing. At the time I didn’t know it, but this was the beautiful-seeing how she impacted as many people as she did. The beautiful far outweighed the ugly. Giving a speech at a loved one’s funeral is the ugliest most beautiful thing someone could ever do. To anyone who is considering giving a speech at a funeral, Bowen says, “Just do it. Everyone there is mourning, so if you cry while speaking, don’t be embarrassed; they’ll cry with you.” Like Molly, I would tell anyone who is thinking about giving a speech at a funeral as a possibility, to go for it. To push through the ugly to get to the beautiful. To do it as a form of closure. When someone passes away we simply don’t “get over it.” There is a gaping hole in our hearts hoping that they will come back. Saying that I don’t cry when I go to her house, see her family, or look at the dress I wore to the funeral that is hanging in my closet, would simply be a lie. I would also be lying if I said “giving a speech at a funeral is easy” because it is one of the most difficult things I have ever done. If I said that “ I just wanted to pay my respects the only way I knew how because she was a woman I loved with my whole heart,” I would be telling the truth.